Are you still thinking about buying seeds for your garden, deciding which seeds to buy? If you answered no, perhaps it is because you have already purchased all the seeds you need for this new growing season? You had "buy all the seeds I need" on your task list for January, so you did it, checked it off. All done. I don't believe any gardener for one minute who says she has finished buying all her seeds by the beginning of February. Perhaps you have decided that this is the year you are not going to sow any seeds. If that is the case, you and I are finished. Kaput. You've defected to some weird place that I don't want to go to or be lured to. The place of no seeds! Come back. You need seeds. Your garden needs seeds. Do you need an intervention? Email me. Leave a comment. I'll help as best I can. Or perhaps, like me, you are still dithering around trying to decide which seeds to buy, how many, etc.? Welcome to the club. For everyone still deciding which seeds to buy, which I believe to be 99.9% of the gardening population, I have developed a Decision-Making Tool for Seed Buying. With this tool you will be able to take the indecision out of your seed buying. It's a simple tool, which is what makes it so easy to use! 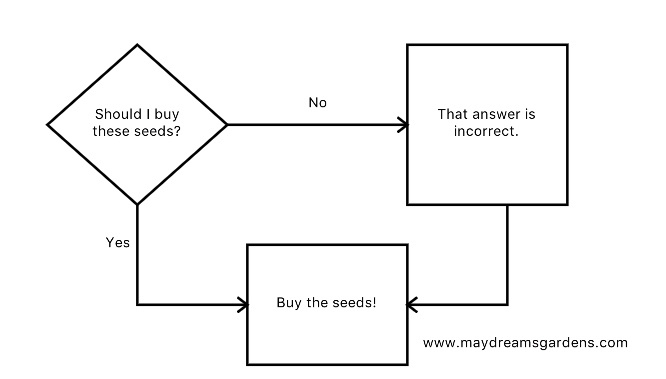 Just follow the arrows depending on if your answer is Yes or No, and my simple Decision-Making Tool for Seed Buying will guide you to the correct answer every single time. Without fail. You might want to cut out my Decision-Making Tool for Seed Buying and take it with you on trips to the garden center. Then when you see all those seeds and can't decide which ones to buy, pull it out, use it, and be assured you've made a good choice. It also makes a handy bookmark for seed catalogs. Garden centers should post this diagram on their seed displays! Funny-funny-funny! Your flow chart is on the spot. Who can resist buying seeds? Not me! This is my first time buying/planting seeds and I’m can’t wait to see if they all come up. I’m can’t wait! Love that flow chart! I really, really, really think I am completely done now (except for the pumpkins still in a wish list, I don't need them yet). I already have 69 winter sown containers outside, where the weather's been mild and now too many have sprouted. Really, I'm done. I am just waiting for the last 11 to arrive by mail. But, then I went to the Dollar Tree today, and bought 9 more I didn't need. At 25 cents each, I did need them! I have a problem. But, it makes me happy and it's my garden, I'll do what I want.